Nobody sets out with the goal of wanting to file for bankruptcy relief. However, things happen in one’s financial life which can lead to that eventuality. For many, there is an unwillingness to jump in and do what makes financial sense. Many people put off filing with the hope that somehow, someway, either their ship will come in or their debt will simply disappear. 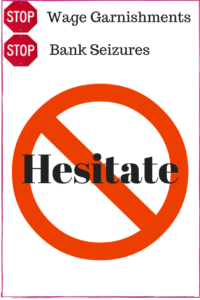 By hesitating in the decision to file, thousands of dollars can be lost by way of garnishments and bank account seizures. I have spoken to clients who have been garnished for months and months before coming in for a consultation. Standard garnishment rates for wages for the state of Illinois amount to 15% of the gross income. This amount can be significant when a person is just getting by from paycheck to paycheck before the garnishment kicked in. Instead of seeking immediate advice, or immediate action, people have allowed the creditor to continue to garnish wages. This leads to an extreme hardship in that there is not significant funds available for pay other outstanding obligations such as rent, food, gas and necessities. In other cases, a bank account can be frozen. In those cases, all non-exempt assets can be ordered to be turned over to the creditor. By allowing a turnover order to be entered, it is too late to stop that particular order with a bankruptcy filing. For the automatic stay to kick in, the bankruptcy case must be filed before the order for turnover is entered. Further, many people do not realize that they have a personal property exemption that they can exert over the seized bank funds. In the state of Illinois, there is a $4000 wildcard exemption which could be applied over any personal property. Funds on hand in a bank account are the type of property that can be protected by the exemption. In addition to the financial harm that can come with hesitating to file, there is also the mental anguish and fear that often is associated with debt. It is hard to function at your best when you are under severe stress from creditors and their collection efforts. It may affect your relationships with others around you as well. You may become more short tempered and ornery with your significant other or spouse. Your children, coworkers and other family members may not be seeing you at your best. You may not be getting the proper amount of sleep which can cause you to be sluggish throughout your day. These are the non-financial side effects of hesitating to file. Based upon the above, it is always wise to seek legal advice as soon as a problem arises. If you are being garnished or if your bank account has been frozen, then you indeed have a problem. By taking immediate action and not hesitating, you can save yourself time, money, stress and hasten your relief. To learn how you can be helped, check out the numerous articles and videos regarding filing for bankruptcy on the website DavidMSiegel.com. After doing so, you may very well decide to hesitate no more.